The car breaks. You lose your job. Your family member dies. Your fridge breaks. The dog gets sick. A tree falls on your house. Whatever the emergency, there are a ton of horrible incidents that don’t fit into the common, everyday budget. You never know when a sudden financial event may come upon you. Funerals are expensive, and, while having a monthly “Funeral Budget” is morbid, having an “Unknown Budget” is quite smart. There’s no way of telling what will make it in your unknown budget this year, but that’s the point. You just don’t know what kind financial challenges life will throw your way, but it is easy to know now that you’ll be happier then if you can overcome them. So add an item to your budget for your least favorite things and turn those future challenges into wonderful success stories. 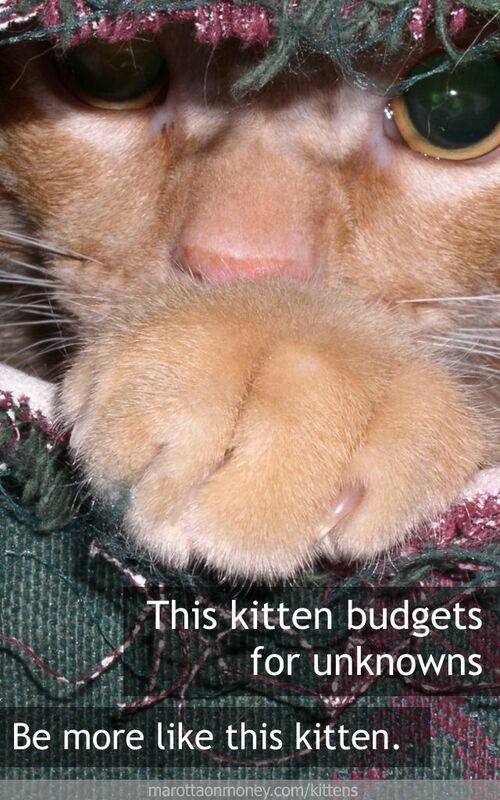 This kitten sets aside 10% of her take-home pay just to pay for expenses she couldn’t have seen coming. Thus, when her friends ripped a hole in her living room sofa, her unknown budget was all ready to take the bill. Now, she can joke about what happened, rather than let a new couch eat into her food budget. What unexpected purchases has life thrown your way? Photo of Fred taken by Kevin Dooley and used here under Flickr Creative Commons. Should You Ditch Your Budget? Life definitely does happen, and it can get expensive, too. The biggest surprise expenses for us have been our heating bills and our electricity bills. Not to mention expensive car repairs that came out of nowhere!